Some people say that getting your kid through the college application process is a lot like childbirth-you have to experience it yourself to really understand it. Unlike with childbirth, where the endorphins kick in and make you forget most of the pain once you hold that precious baby in your arms, the only chemicals associated with getting your child into college are stiff drinks (for the parents) and plenty of aspirin. Luckily, we can now add a healthy dose of laughter to the college admission cocktail, thanks to J.D. 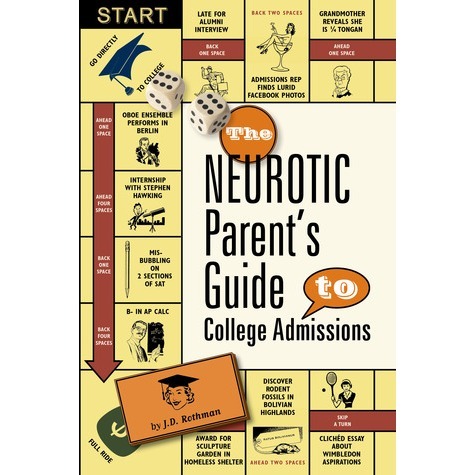 Rothman’s new book, The Neurotic Parent’s Guide to College Admissions. With a sassy, sarcastic style that reminded me of The Official Preppy Handbook, Rothman does a spectacular job of skewering the collective craziness that overtakes otherwise rational people during this phase of their lives. At the same time, it’s not just funny but also provides valuable insights and incisive anthropological observations into the process. “There’s a collective neurosis kind of thing that takes place for parents during this time of their lives,” explains Rothman, who is an Emmy-winning television writer and lyricist in her other work life. After an eye-opening college tour with her older son (now a junior at Duke), she started the anonymous Neurotic Parent Blog as a way to reflect on the nutty parents who had “started their kids in college preparatory programs in the fifth grade,” as well as the “thousands of shockingly bright, polite, alert students, all of whom were vying for her son’s (or your daughter’s) spot.” Up until that trip, she had “no idea there was this level of insanity about the college admission process.” The blog quickly caught on and went viral after a post about Cornell’s hotel’s ugly bedspreads. Rothman admits that she too got caught up in the craziness. Some of the other students had out of this world accomplishments, like “discovering galaxies,” so she wondered how her son would ever compete. Like many parent trips, the first one you feel during the college application process is guilt. Rothman writes, “Clearly it is all your fault. While you were letting your child engage in normal activities like summer camp, babysitting and bowling, other kids were interning for their senators, training seeing eye-dogs and starting hedge funds in Sri Lanka. As a result, for every impressive kid, there are 50 even more outstanding ones.” She observes that even parents who were “not neurotic about other things like eating and sleeping still became neurotic about the college admission process. … Thankfully it is usually not both members of a couple,” she laughs. “Thankfully” is right. Though I often want to give therapy bonds as baby shower gifts, this book will make a pretty good substitute. Laughter is clearly the best therapy for Rothman, who offers up an amusing “prayer for the SAT” (please protect me from mis-bubbling and using passive voice, bless my number two pencils and protect their points), two pages of “haikus for the neurotic parent” and an entire chapter about “barista readiness” (a college degree is fine, but at the end of the day, they’d better know how to prepare a venti, sugar-free, nonfat, vanilla soy, double-shot, decaf, no foam, extra hot, peppermint white chocolate mocha). Asked if her current book tour has made her more or less neurotic, Rothman, who will appear at Chaucer’s on Sunday at 2 p.m., says, “definitely more, but now I’m neurotic about selling books.” Of course it doesn’t hurt that her younger son was recently accepted into his “dream school.” Unlike the rest of us there will be no more college applications for her to deal with in the future-unless the kids don’t like being baristas and want to go to graduate school. The upside? That might mean there’s another book in her future, and ours. Since my son’s only in seventh grade-and hasn’t, to my knowledge, written any symphonies or cured any diseases-this is definitely one book I plan to keep on my shelf for future reading. As Rothman says in her “orientation to college angst,” “whether you have a kindergartener or a 12th grader, may your child’s search be full of multiple acceptances, generous merit scholarships and chill roommates.” If they’re not, may you at least retain the ability to laugh at it all! = Spend your tax day in a lively reading and conversation about the insanity of modern college admissions at Chaucer’s Books, 3321 State St. Sunday, April 15 at 2 p.m. When Leslie’s not stressing about her son’s lack of Olympic curling credentials, Mandarin language and Ethiopian cooking skills, she can be reached at Leslie@LeslieDinaberg.com. For more columns visitwww.LeslieDinaberg.com. Originally published in the Santa Barbara Daily Sound on April 13, 2012. I can’t help but smile when I see Strawberry, Banana, Tree and Sun grinning from ear to ear, as they greet Thunder with the thunderous enthusiasm her name deserves. “Yay. Awesome. This is my favorite kind of day,” shout the others. No, this is not some strange morphing of the Nature Channel and H.R. Pufnstuf flashbacks from my childhood. It’s just a regular old Tuesday afternoon, and I’m watching Environmental Education for the Next Generation (EENG) at work in Judy Cosio’s second grade classroom at Monroe Elementary School. This entirely student-run nonprofit organization-connecting student volunteers from different universities with first and second graders to explore hands-on science experiments and promote sustainable action-is the brainchild of Ryland King, a UCSB undergrad. Inspired by his work as a surf camp counselor with a developmentally disabled child and a volunteer stint at Isla Vista School, King started the group in 2009. 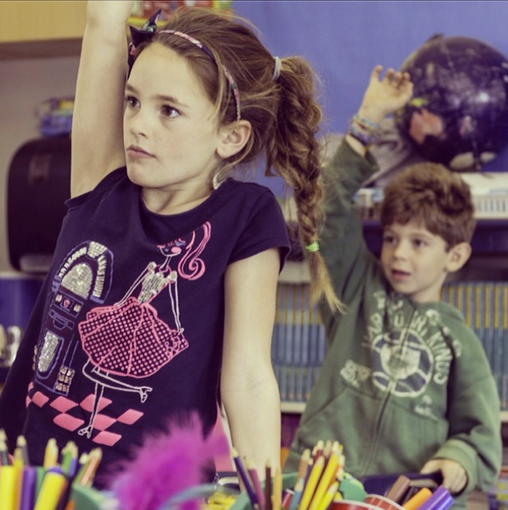 “I really kind of learned that when one teaches, many people are affected,” he says. Isla Vista, Howard, Adams and Hope. moment they walk in the door. of it. … I’m blown away every time by how inspiring it is,” says Ryan. used to review the lessons with the kids, they definitely knew their stuff. like a cross between school and a really great nature camp. son started monitoring our electricity usage. mentor each other, training new volunteers as EENG grows. free of charge, to your elementary school. Originally published in the Santa Barbara Daily Sound on April 6, 2012.